Hermann J. Wiemer is one of the pioneers of viticulture and winemaking in the Finger Lakes. A native of Bernkastel, Germany, he studied at the world famous Neustadt Viticultural Research Institute, took a winemaking job in the Finger Lakes, and became a seminal figure in raising the quality of the region’s wines. Today, his long time apprentice and Cornell grad Fred Merwarth is winemaker, and he and business partner, Swedish agronomist Oskar Bynke, have lifted the quality of the wines to new heights. We met with Fred at the winery during our late 2018 visit to the Finger Lakes to taste his wines and talk about winemaking. Our tasting notes are given below. They are also available, along with reviews of a large number of other Finger Lakes wineries, in our recently published report Wines of the Finger Lakes. Wiemer purchased 80 acres of land in Dundee on the western shore of Lake Seneca 1973 and began planting vines in 1974. 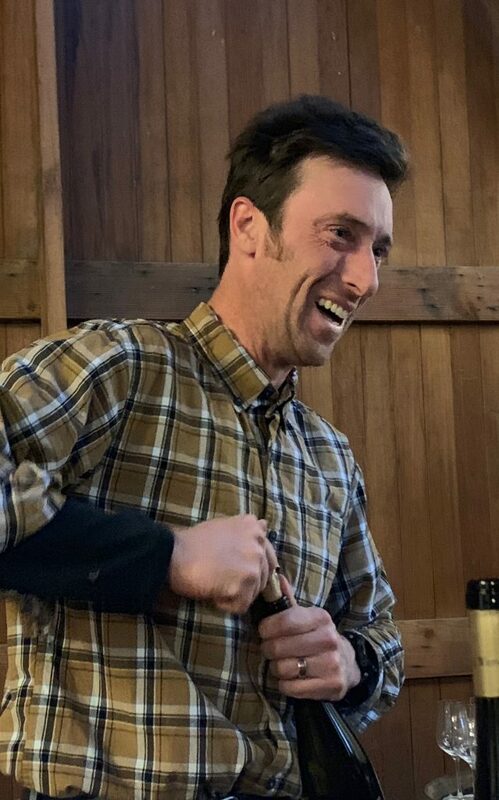 Fred [shown here] became winemaker in 2003, and since 2007 he and Oskar have owned and managed the winery and its three main vineyards—Magdalena, Josef, and HJW. 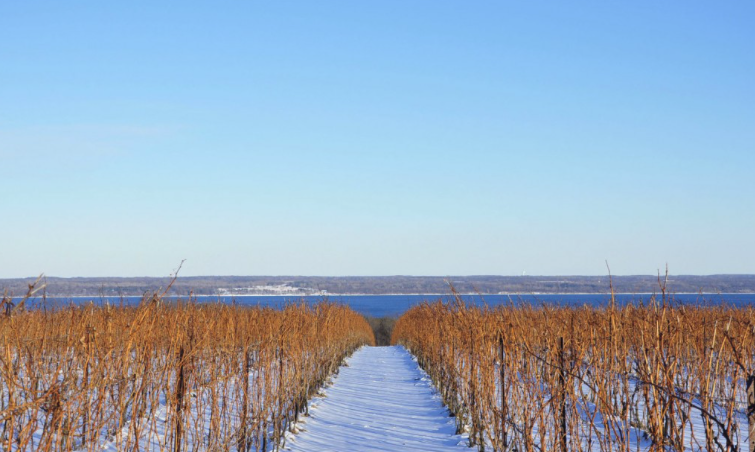 They also manage the nursery that Wiemer originally established and which provided much of the wood used to increase vinifera plantings in the Finger Lakes. They’ve converted the vineyards to organic, unusual given the disease pressure of the region, and are now using biodynamic practices on selected parcels. All fruit is hand harvested and hand sorted; all fermentations use ambient yeast with extended lees contact. Total annual production is about 14 thousand cases. Hermann J. Wiemer 2013 Cuvée Brut Seneca Lake ($37) 93 Lively precise aromas of Meyer lemon and freshly baked bread are mirrored on an energetic, focused palate. There’s a strong mineral component that contributes to its striking purity. Finishes rich and long with excellent clarity. A blend of 65% Chardonnay and 35% Pinot Noir aged sur lies for 48 months and disgorged August 2018. 4 g/L dosage. Hermann J. Wiemer 2017 Dry Riesling Seneca Lake ($20) 91 An astounding Riesling for the price, the Dry Riesling reveals expressive stone fruit on the nose. The flavors are dense and rich with a peppery quality and beautiful balanced with tangy tangerine acidity working in tandem with the sweet fruit. Great balance and freshness! This is the winery’s flagship wine with the HJW vineyard as its fruit backbone. Hermann J. Wiemer 2016 HJW Vineyard Riesling Seneca Lake ($39) 93 Sourced from vines Hermann J Wiemer planted in 1977, this is a decadently rich, sumptuous Riesling showing concentrated ripe stone fruit with notes of minerals and a super rich lingering finish. Elegant texture and perfect balance. Just 7 g/L RS Hermann J. Wiemer 2016 Josef Riesling Seneca Lake ($39) 94 This Auslese style, super concentrated Riesling from the Josef Vineyard (planted in 1974) reveals aromas reminiscent of poached pear and ripe stone fruit. There’s a hint (2%) of botrytis, but most the botrytis affected bunches are left on the vine to be picked 6 weeks later for TBA. The grapes are spontaneously fermented for 7 months, leaving a wine with 59 g/L RS and under 10% alcohol. Hermann J. Wiemer 2016 Riesling Magdalena Vineyard Seneca Lake ($36) 95 This single vineyard Riesling made from a special vineyard on Seneca Lake is just off dry, the product of a long slow, spontaneous fermentation that began in October and only ended in July. The extended lees contact contributes to the full mouthfeel and complex flavors of this very special wine. Effusive aromas and flavors of nectarine, apricot and a hint of gingerbread. Fifteen separate pickings of the vineyard illustrate the meticulous winemaking behind this Riesling. 9 g/L RS Hermann J. Wiemer 2017 Grüner Veltliner Seneca Lake ($27) 91 Beautiful aromas of peach and almond and a touch of orange citrus. A rich and complex wine that’s peppery with spicy gingerbread complementing stone fruit notes, all working in tandem with vibrant, fresh acidity. Made from two pickings, early and late, of the same vineyard. Hermann J. Wiemer 2016 Lemberger (Blaufränkisch) Seneca Lake 94 A big, earthy Blaufränkisch showing dense, spicy red fruit. Made with 50% whole clusters in open top fermenters and matured in 700L barrels for 15 months. It’s done in a compelling, elegant style that compares with the best of Austria. This entry was posted in Great Winemakers, New York, Red Wine, Sparkling Wine, Uncategorized, White Wine, Wine Articles, Wine Type and tagged Featured. Bookmark the permalink.